I’m at the bus stop in Lund waiting for number 137 to take me home. It’s 1994 and I just attended high school philosophy class. I swoon. Really! In Elead some 2500 years earlier, Parmenides wrote,that there is only one. Nothing changes. Being is a round fullness totally exhausting all there is. There is no room for void. Our senses betray us. Further east, Heraclitus claims there is only change! Forces are flowing and struggling like the river we can’t step into twice. It will not be the same the second time. You will not be the same. How could I not swoon, thinking – really thinking – the world in these contradictory ways? Almost 25 years later, reading Cosmetic Psychiatry did not make me metaphysically dizzy in the same way. It didn’t shock me profoundly. But Brian Eno, mostly known as a composer and music producer, in his diary A Year with Swollen Appendices (1996) supplied several small essays and stories that I think are worthy of their time. They have lingered with me and kept popping up as references in my design practice. Eno wrote about how “interactive” was the wrong word and why we should talk about “unfinished” to designate a shift from providing complete experiences to platforms for action and interaction. For many years my Unsworn practice was spurred by the paradox of trying to craft the perfectly unfinished. 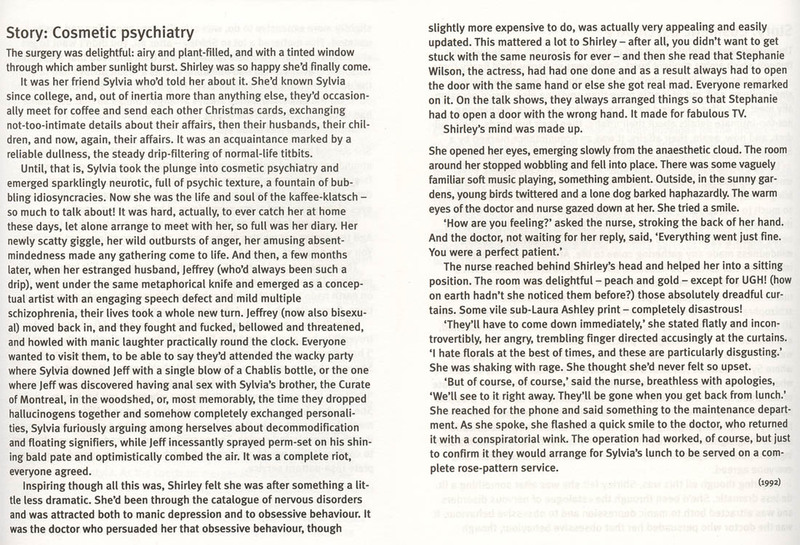 And then there was the Cosmetic psychiatry story. John woke up after a good night’s sleep. The [insert new, delightful and useful digital device here] played a selection of John’s favourite songs and relevant news. With a swift gesture of the hand John switched off [the delightful, useful device] and went to work with a smile. These weren’t stories that richly described a potential future. These were (bad) sales pitches, not generative design tools. Eschewing even the most basic of narrative insights, these new (delightful and useful) devices were always centrepieces of the “stories”, embodying the dream of the designer-author to have lasting effect on the user’s (“protagonist” would be too flattering) lives. Eno’s story provided a format for a concise yet fleshed-out scenario de-luxe that managed to capture context and rationales, beyond the end product. The imaginary design product brought into existence by the story – that of attaining a charming and quirky psychological “defect” through a medical prodecure – also troubled the instrumental rationality of design of the 1990s. This product is an intimate, behavioural tweak, a story-catalyst (for the well-off) for a slightly more adventurous everyday. By pushing the limits of idiosyncracy the notions of functional and useful are taken to extremes. Eno keeps the product within the realm of design, as opposed to art, by referencing the human needs involved and positioning the procedure as a commodified service. By Eno also expresses the property and power of capitalism to bend, not break. Capitalism is not troubled by fighting technical rationality with idiosyncratic products; these will easily be approriated and monetised. We should also remember that at this time there were hardly any big-budget social fiction show, such as Black Mirror, to provide darkly humorous speculations on the social consequences of emerging digital and biological technologies. The very form of the scenario de-luxe is here to stay as a design tool and, perhaps, a format for critique. Eno, B., 1996. A Year with Swollen Appendices, London: Faber & Faber.